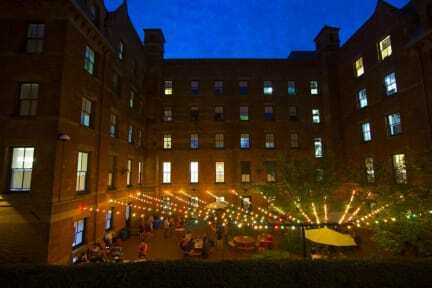 HI NYC Hostel i New York, USA : Boka nu! Översatt av Hostelling International New York har lovordats av många av våra besökare för deras sällskaplig atmosfär. Våra gäster säger att deras personal är "mycket hjälpsam och välkomnande", de har "bra gemensamma utrymmen för att mingla" in och "de erbjuder en massa extra aktiviteter (utflykter, resor) som är valuta för pengarna". Det finns två tunnelbanestationer inom två kvarter, ansluter direkt till Lincoln Center, Times Square, Penn Station, Brooklyn och Soho. Vi gillar deras stora sjunkna uteplats - en sällsynt plats att sträcka ut på Manhattan. Great hostel!!! The area is nice, hostel is clean with good rooms and lots of public areas. Great kitchen and bathrooms, and a lovely garden where everyone was hanging out. Also the breakfast was very good! Loved my stay at the hostel. Never stayed at a more clean and tidy hostel before. Very friendly and helpful staff. Highly recomend it! Definitely enjoyed my stay at this hostel. I've stayed at many different hostels around the world, and this is definitely on my Top 5-list. As money people has said there is not much of a social atmosphere here, but for me it was okay, I had my own plans. And they do organise tours and activities but I didn't participate. The rooms and toilets are clean and comfortable. Overall a good hostel! It’s located really close to the subway which takes you to all the main attractions in no time. Hostel felt clean, and they had great guided tours and other stuff to attend. Only negative things were that the water pressure in the showers were low, and that the beds were hard. They also didn’t have any bar where you could hang out, the only nice place to hang out was the cafe as the patio was too cold. This hostel is located in what looks to be an old school building on upper west side just a block away from the subway. The old building gives it a nice atmosphere and there are lots of common spaces and a nice backyard. Everything is very clean and well taken care off. Specially big thumbs up for the shower and toilet areas. Great value for money if you are looking for a quite hostel to enjoy NYC! Clean, good location in a neighborhood that felt safe, close to metro and central park. Expensive but it is New York. Very big hostel and not much social atmosphere. There were organised tours. Everything was fine but the rooms temperature. It was so hot and humid. Don't stay in the room 208. The hostel itself is nice and clean, but it isn't the best one I've stayed in, I've stayed with 2 other HI hostels in the US and they were both better and cheaper. The hostel is very big so you don't get that special hostal feeling of community. The beds are nice and the staff is friendly and helpful. In my opinion, for the price they charge they could definitely include breakfast. Overall a good hostel for a couple of days, but don't expect anything special.